The python was due to be transferred to Malaysia’s Department of Wildlife when it passed away. A MASSIVE PYTHON found in a Malaysian construction site last week, thought to be the longest ever caught, has died. 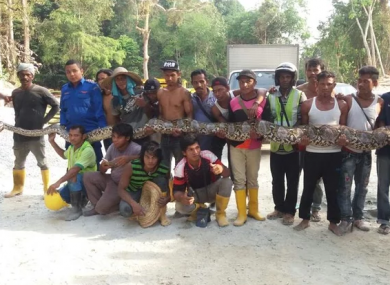 Civil defence forces who captured the snake in Penang, a popular tourist destination, on Thursday estimated its length to be eight metres. Builders working in the Paya Terubong district of the island had alerted authorities after spotting the animal under a fallen tree. A local official told the BBC that the python died yesterday after giving birth. It was due to be transferred to Malaysia’s Department of Wildlife, the broadcaster said. The current record for the longest snake in captivity is 7.67 metres, according to the Guinness World Records. The record holder, a reticulated python called Medusa, is owned by an American entertainment company and displayed at a haunted house attraction in Kansas City, Missouri. Email “'World's longest snake' dies after capture on tourist island”. Feedback on “'World's longest snake' dies after capture on tourist island”.